Great news everyone, the split 7″ INSOMNIA ISTERICA / GROSSEL is out, or will be out in few days ! check the Euro Mince madness !! Also the 4 ways split between Grossel, Nasty Face, Chin Sniffer and Blood Snorter will be out soon ! KARCAVUL LP and DAYS OF DESOLATION / TRAVOLTA split 10″ ALSO OUT !!!!! Cette entrée a été publiée dans Non classé le 3 août 2016 par deafdeathhusky. Here are some new (more or less) things about the label. Warfuck – don’t believe the tape was released in February for their Japenese tour, stocks are still available ! The tape contains their complete discography until now : 2 first albums and their brand new EP « Don’t believe the hype. The tape reissue of Whoresnation / Doomsisters has also been available since last week. Two bands from the French East Coast, Whoresnation plays grindcore while Doomsisters deliver a massive mix of grindcore, powerviolence, sludge and crust. Archagathus / Sram, split 7″ is also available now ! Whoresnation / Chappa’ai 7″ will be released in approximately two weeks. Cette entrée a été publiée dans Non classé le 6 avril 2016 par deafdeathhusky. 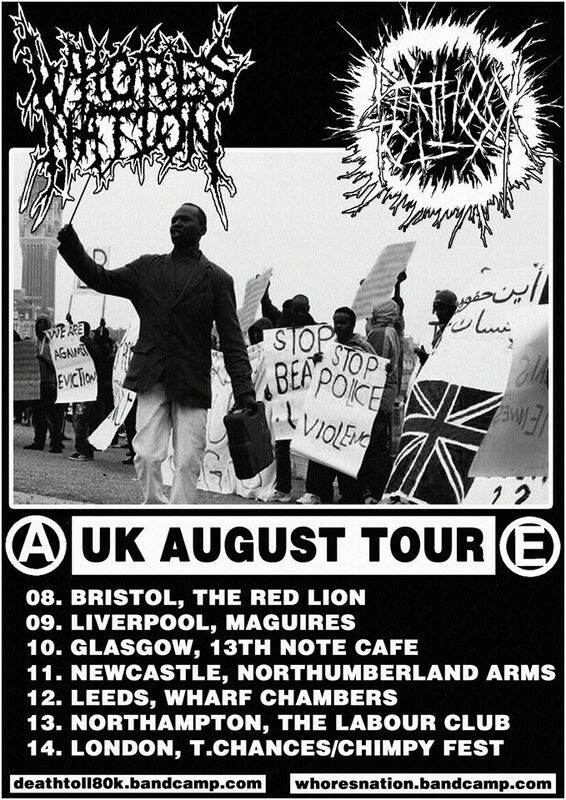 I’ll be on tour with WHORESNATION and DEATH TOLL 80K with the DEAF DEATH HUSKY distro, check us out. Cette entrée a été publiée dans Non classé le 3 août 2015 par deafdeathhusky.